The text of the interview was originally published in Storia Contemporanea no. 3, September 1973. 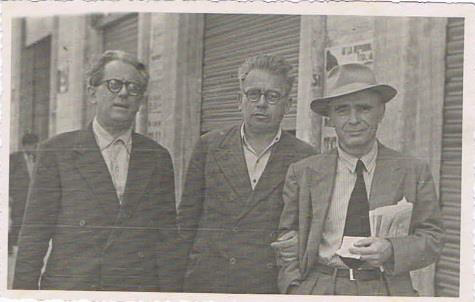 Bordiga also spoke to journalists Sergio Zavoli and Edek Osser for a filmed interview, excerpts of which were included in a documentary on the rise of Fascism. Translated by Giovanni Tiso. This serves as an excellent survey of the early history and positions of the communist left in Italy. It deals not just with fascism, anti-fascism and frontism as the title might imply, but also the formation of the communist party in Italy, the attitudes to the socialists, the development of the revolution in Russia, the weight of the peasantry, centrism/Stalinism. It is very interesting in the remarks on relations with Gramsci and finally, on 'philosophy'. "I was there from the first session, during which Lenin gave a memorable speech followed by a standing ovation that lasted over an hour." There must have been a lot of sore hands at the end of that... but, seriously, why is this authoritarian being posted on a libertarian communist website? Particularly as he clearly learned nothing from the failure of the Russian Revolution and of Marxism. See comment here. Please continue discussion about whether Bordiga should be on libcom on the other thread. Any comments to that effect here will be deleted.